Handcrafted Green Jade and .925 Sterling Silver Ring, "Sweet Maya"
"Sugar cane is one of our most important natural products, so we thought we'd celebrate it by designing a collection in its honor," the Jiménez Family explains. The sterling silver design features florid openwork escorting lush green jade mined in Guatemala. Regarded as the stone of immortality by the Maya people, jade is said to attract love. 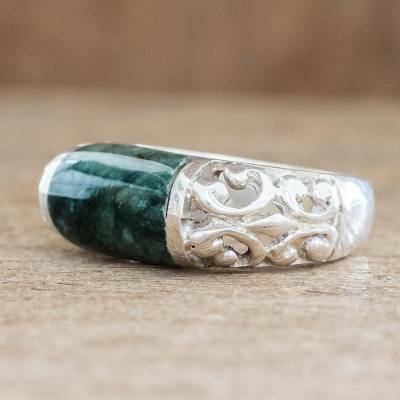 You can find jade domed ring 'Sweet Maya' by Jimenez Family in jewelry categories such as Good Luck Rings, Jade Rings, Silver Rings, Sterling Silver Rings, Domed Rings and Single Stone Rings. Enjoy exploring these sections for other Novica treasures. "A favorite 'go-to' piece of jewelry"
My daughter loves this ring! Such a unique design and beautiful workmanship. Loves the fact that no one else has one like it! "Beautiful jewelry .. I'm in love with my ring"
It's a beautiful ring and great quality .. I will continue to be your number one fan of such beautiful jewelry. This is a beautiful ring with an unusual design. This ring started me buying more dark jade jewelry. "The perfect token of love"